Keeping our bird-feeder filled is a task -- even in summer when berries, seeds, etc., are readily available. The pay-off is that we have a wide variety of feathered visitors stopping by for a snack. Photographing birds is an exercise in patience, but I've been surprised at how many stay within range of my lens long enough for me to capture a few images. 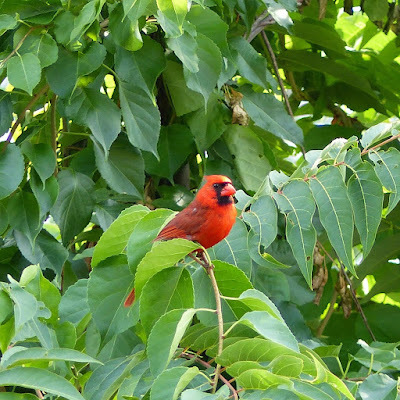 The male cardinal in the photo at right was a regular visitor a few summers ago, and although somewhat shy, seemed almost proud of remaining within focus for a few minutes. 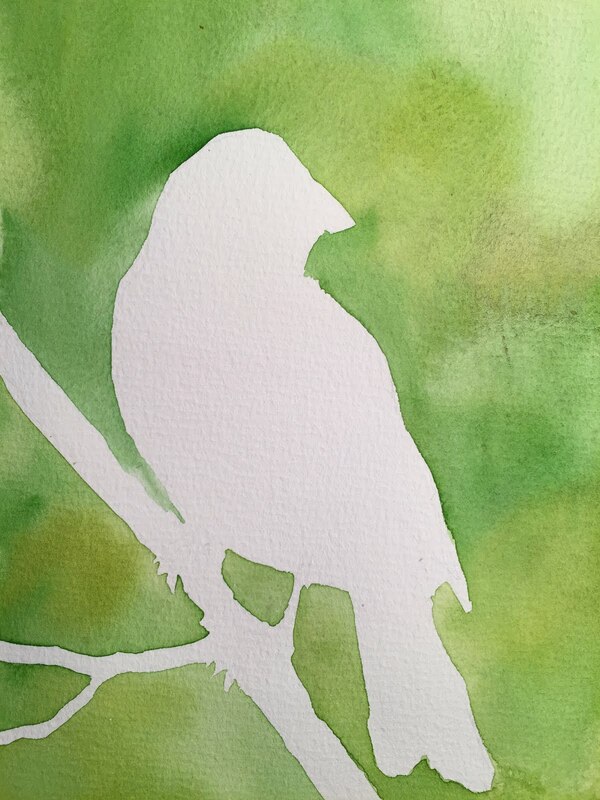 In my watercolor sketch, I took a few liberties with the setting -- adding some blue sky for contrast -- but tried to capture his leafy hide-away. 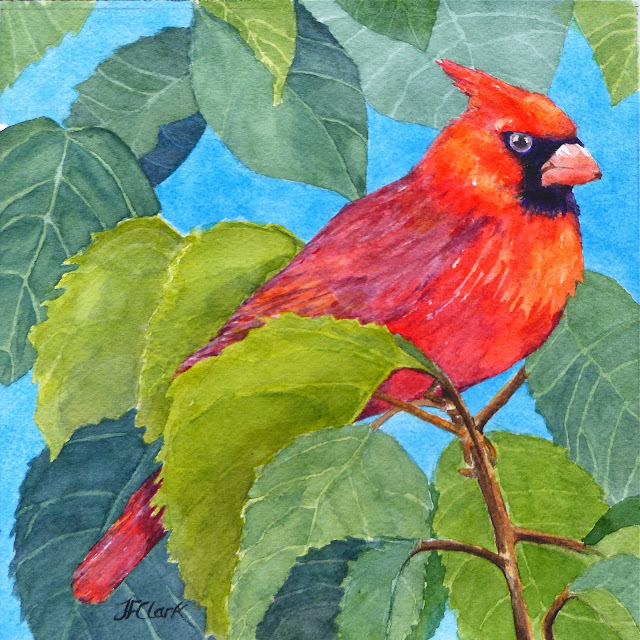 "Male Cardinal" 6" x 6"
Goldfinches are smaller and more skittish than cardinals. 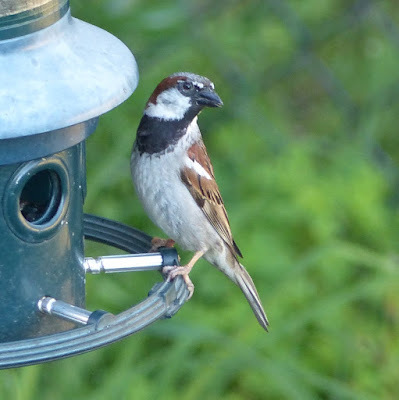 To capture them in a photo means waiting for just the right moment, with the camera aimed at the bird-feeder. 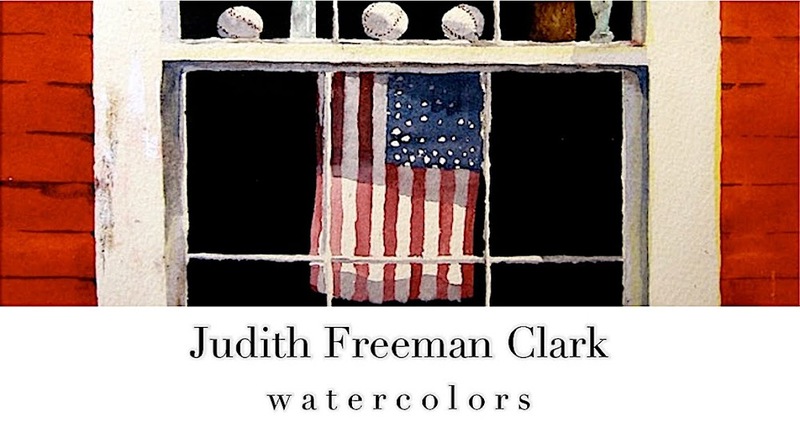 I used the automatic shutter on my camera to take a series of shots in rapid succession, knowing that my painting would be a composite of several images. 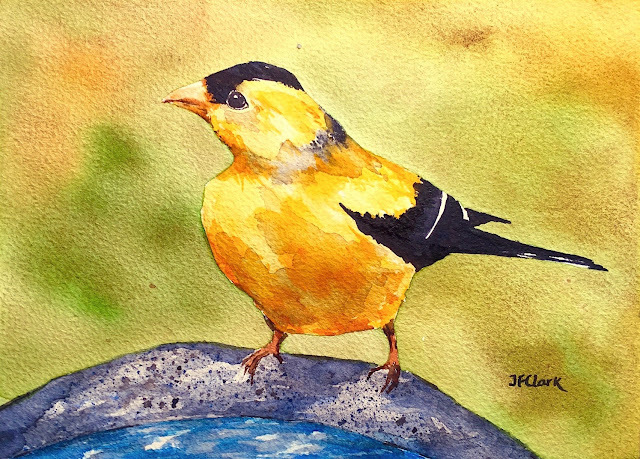 My goal was to get a good look at the coloration and shape of the goldfinch's beak, and then create a watercolor sketch that was reasonably faithful to the real thing. In the painting, I eliminated the bird-feeder and perched the finch on the edge of a large ceramic saucer that we fill with water for the birds. 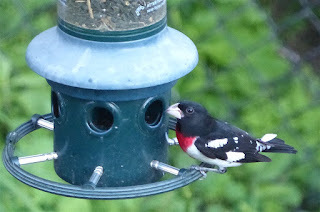 Several Rose-Breasted Grosbeaks showed up late one afternoon at our feeder. I hadn't seen any of these for decades. I immediately thought of my grandmother, who was diligent about scattering seed for the birds and who taught me many of their names. But the bright red bib and sleek black feathers, which are quite distinctive, made it easy to identify. 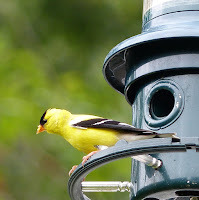 wasn't easy to get a good shot of this very busy bird. 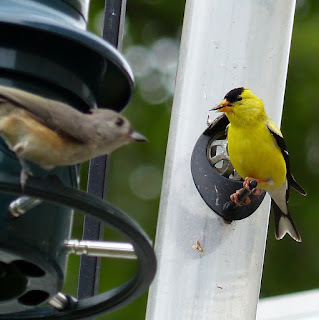 He was perched at the feeder along with a young male, and I learned from the Audubon "Guide to North American Birds" that adult males often feed their younger counterparts. When planning my watercolor sketch, I referred to a photo of a House Sparrow that I took the same afternoon as the Grosbeaks. I thought the sparrow's pose would work well as it has a more dynamic aspect than a bird simply pecking away at the feeder with its face half-hidden. 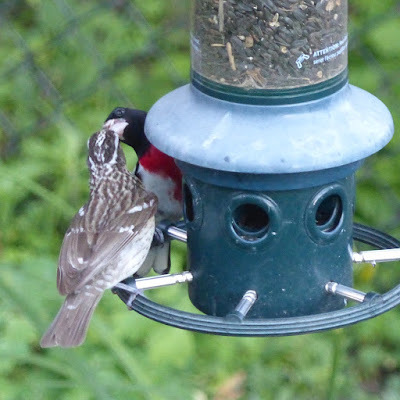 The sparrow's pose also would show the adult male Grosbeak's red bib to better advantage. 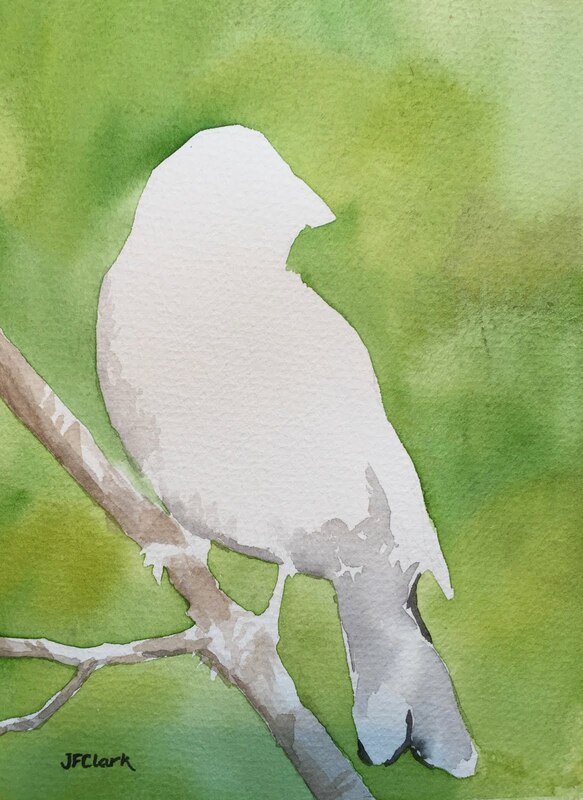 Rather than placing the bird at the edge of the feeder, I sketched in a small branch. 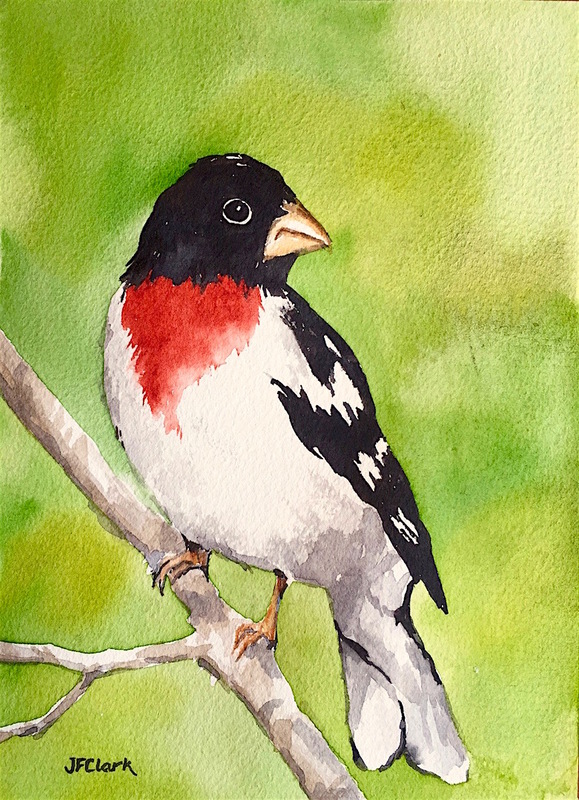 "Rose-Breasted Grosbeak" 5.5" x 7.5"